A Pileated Woodpecker (Dryocopus pileatus) searches decaying logs for insects. Taking advantage of a recently-rare pretty day, we paid a visit to the Lorain County Metro Parks’ Sandy Ridge Reservation – a haven for nature lovers and, especially, birders. A long trail through swampy woods connects the reservation parking lot with a large, open wetland area. While most speedily hike the trail in an effort to get to the open area (or away from resident mosquitoes) there is much to be seen in those woods. The excitement began as we heard an unusual (to our ears) bird call — a Plieated Woodpecker noisily announcing itself as it dropped to the forest floor in search of insects in and among the decaying logs there. This particular bird seemed especially large even for a Pileated Woodpecker. We watched and photographed for a couple of minutes as it powerfully plunged its beak into soft wood, hopped from spot to spot, and then took off deeper into the woods. A Most Impressive Bird! 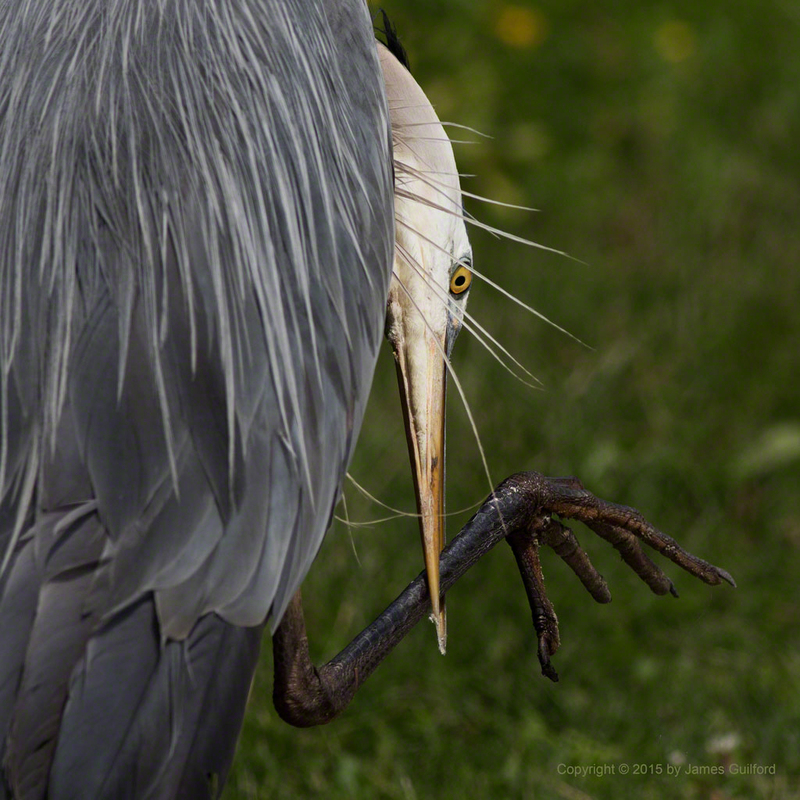 A very cooperative or naive Great Blue Heron (Ardea herodias) ignores the nearby photographer whilst hunting for a meal. Along the shores of the shallow open waters of the wetland, we spied a Great Blue Heron. Expecting it to take flight at any moment, we were surprised when the heron tolerated our close approach; it was fully focused on hunting for fish. The bird, either fearless or (more likely) naive, slowly paced along the shore, wading in very shallow water, stopping when it sensed prey nearby. Lucky Bird, Poor Fish. 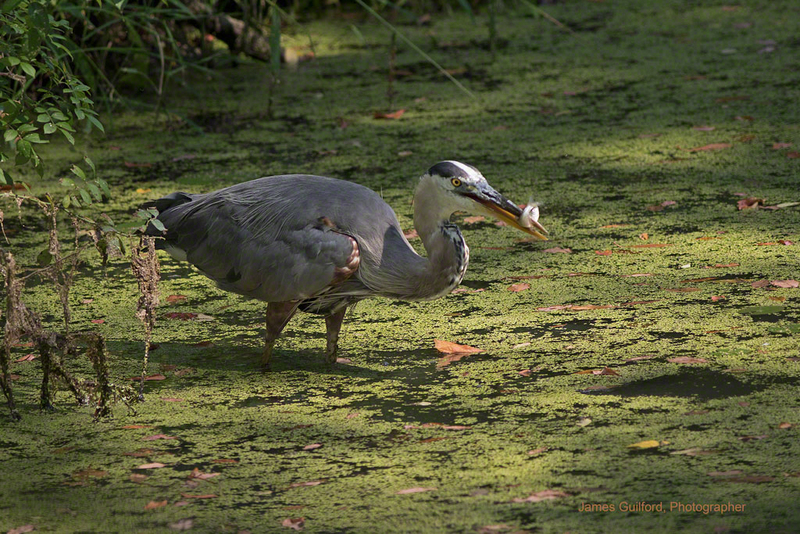 A Great Blue Heron (Ardea herodias) snags a small fish. This particular heron enjoyed three successes while we watched, snagging small fish and then swallowing them whole. Someone commented that the woodpecker was a beautiful dinosaur and, while that may be true, Great Blue Herons make me think of Pterodactyls every time! A Great Egret (Ardea alba) flies low over the water, a wingtip touching its surface. The Sandy Ridge Reservation is a haven for Great Egrets; I see more of the big white birds there than anywhere else we roam. The egrets hunt, squawk at each other, fly from spot to spot, providing lovely contrast to the largely darker, more subdued wetland scene. A female Red-Winged Blackbird (Agelaius phoeniceus) perches on a mature cattail reed to take a look around. The wetlands of Northern Ohio with their crops of cattail reeds are ideal homes for Red-Winged Blackbirds. We enjoyed the blackbirds’ songs and raspy calls, and the shiny black plumage of the males with their colorful shoulder patches. More subtle, less visible, but wholly beautiful are the female Red-Winged Blackbirds with their streaked bodies and warmly-colored heads; they are a delight to discover. We saw yellow warblers, water snakes, many Great Egrets, Red-Winged Blackbirds, Great Blue Herons, a nesting Bald Eagle, dragonflies, squirrels, Tree Swallows, chipmunks, turtles, and during our wood-lined exit, a little Gray Treefrog, all on our walk in the woods. It was a day full of wonder. A Gray Treefrog (Hyla versicolor) rests, hiding in clear sight on a small tree branch. Since moving here late last year, I’ve wondered if the pond drew more than ducks and geese to feed, rest, and nest. This morning we spotted this beautiful Great Blue Heron perched on a tree trunk! I shot pictures as I slowly moved closer; the heron was aware of my presence. It wasn’t until the bird had enough of me that I learned, hidden below the edge of the bank was another Great Blue Heron! Hate to admit it: I was totally unprepared for the pair taking off together over the still waters of our pond. Still, I’m pretty happy with this portrait. March 29 was a beautiful day and inspired me to pay a visit to a very active heron rookery in the Summit Metro Parks system, immediately adjacent to the Cuyahoga Valley National Park (CVNP) at the north end of Akron. 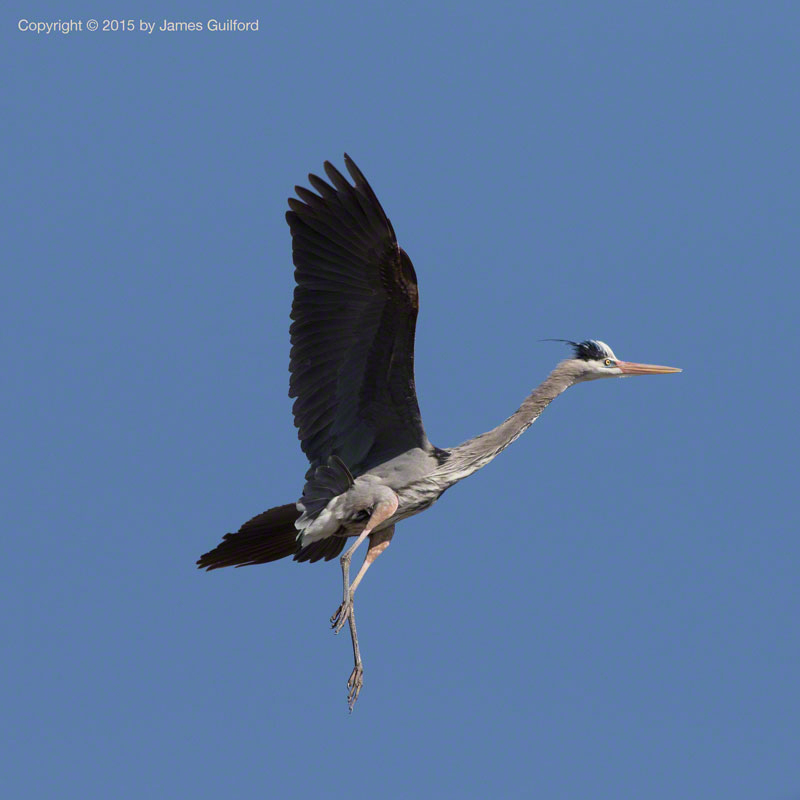 I was pleased to discover that the resident Great Blue Herons were still working on their nests, providing me with plenty of “photo ops” for catching them in flight. The trees that support the heron nests are part of an open wooded area, affording the birds access to fallen twigs and other materials with which to build and maintain their nests. Every so often a bird launched from a treetop, glide away, and circle down to the ground. Strolling around for a while, the heron would find just the right stick needed and, grasping it in its stiletto-like beak, lift from the brush. High into the air, the bird would soar, circling around for the right approach, and ever so gently alight near its nest. Mates, if on the nest, exchange greetings and the stick may be handed off. Because the woods are full of herons, smaller birds and animals, raptors are also present. I had been told about hawks and eagles being around and occasionally spooking the Great Blues but I hadn’t seen them. This evening, however, was different. First one motorist, then another visitor flagged me and described where a Bald Eagle was perched. The first site was distant, in the shade, with strong backlighting — none-too-photogenic. The second site, however, put the eagle in a fairly decent position for photography: well-lit with the sky behind. Up til now, the only Bald Eagles I had seen in the wild were either perched far away or flying away from me but not this bird! Apparently a young adult (four to five years old), the eagle watched the rookery from across a road! The eagle’s tree-top spot allowed it to see the main rookery, a secondary nesting area, and an open field; an excellent location for passive hunting. I got some decent shots, even if partly obscured by tree branches! Sunset was approaching and I wanted to check out a nearby portion of the CVNP called Beaver Marsh, so I packed up and headed down the road. The wetland offered open waters and open sky to the west and the possibility of some nice evening views. A few visitors were on the boardwalk watching native beavers go about their business. Robins and other birds were singing their evening songs. And Canada Geese were noisily settling in for the night. As I watched, a small group of geese began to fly over the spot where a pair had set up for the night. One of the floating birds looked up and squawked loudly as if to say, “Go! This is ours!” The birds overhead kept flying, leaving those below swimming on rippled waters lit by setting sun. I really didn’t want to leave — the sky, the water, and the sounds were so beautiful — but it was getting cold, and I was expected home. I do plan, hopefully one day soon, to return “after hours” to enjoy evening’s wings. Taking advantage of a pleasant morning following a very rainy day and preceding more clouds, we paid a visit to the heron rookery of the Summit County Metro Parks. The rookery, where the big birds make their nests, is situated along the Cuyahoga River at the north end of Akron, Ohio. 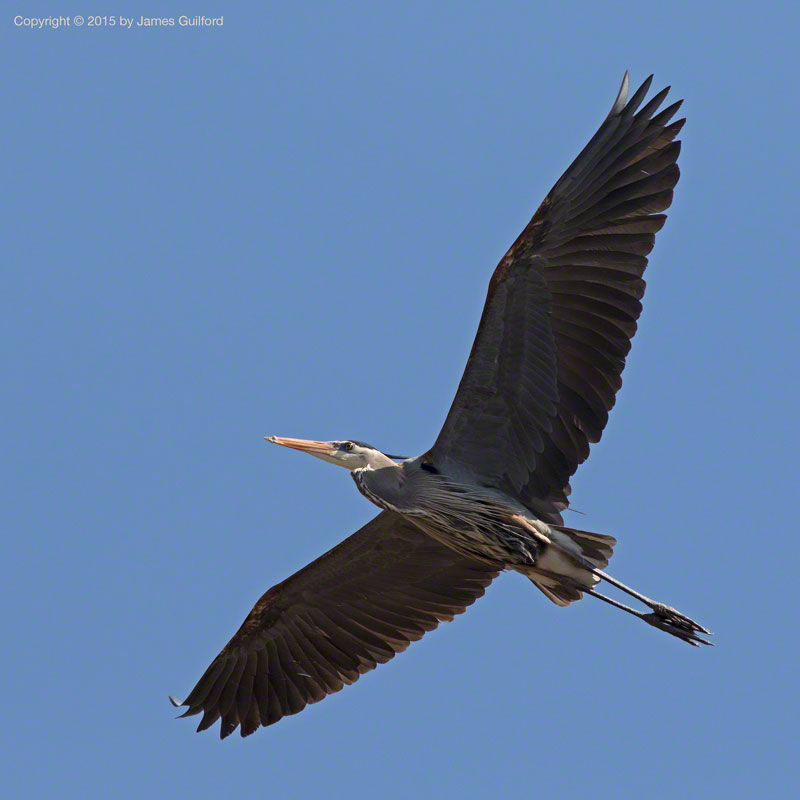 Every year flocks of Great Blue Herons (and bird watchers) descent upon the site. Parking areas along the busy road bordering the nature preserve allow easy access, though utility poles and wires along the road often interfere with watching and photography. This year, for the first time, we saw the entire population of herons abruptly rise into the air and circle high above their nests. Apparently, the birds were spooked by the appearance of a Bald Eagle and/or hawk near their nests. The huge herons probably stand a better chance against raptors as a group and in the air than when standing on their nests. The weather this week is expected to be cloudy with rain chances every day but we hope to return soon for further developments during this year’s nesting. I spent some quiet time along the Ohio & Erie Canal in the Cuyahoga Valley National Park late Sunday morning watching the herons. 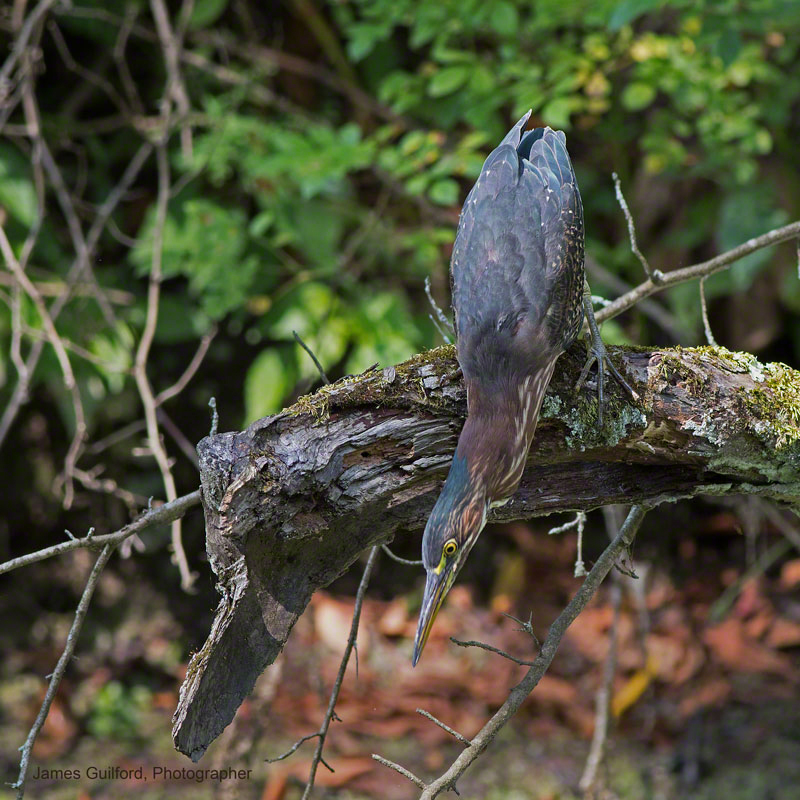 I was surprised at how many Green Herons I spotted — at least four — and how close I was able to approach two of them. The first of the greens was perched on the trunk of a tree that had long ago fallen into the canal. From the wooden perch the smallish bird watched for prey, preened, and even messed with a twig it picked off the trunk! A little farther down the canal I watched a Great Blue Heron as it struck a typically statuesque pose studying the water for signs of fish. After a while the blue struck and caught a small, wriggling fish. I shot a good number of photos whilst standing or sitting and watching the green and blue herons but the best part was just quietly being there. Today was a very active day in the wetlands of the Sandy Ridge Reservation, Lorain County Metro Parks. There was a large number of Great Egrets present, sometimes chasing each other, squabbling over fishing rights or something. The big white birds perched and waded everywhere providing photo-ops galore! I spotted a little Kingfisher but, sadly, did not get a useable photograph. A Whitetail doe and her fawn crossed our path in the woods. Tree swallows were everywhere, as were dragonflies. A few Great Blue Herons were also present and one, in particular, behaved in a very unusual way; the tall wader seemed to prefer walking on the crushed gravel pathway provided for human hikers. What is more, the heron allowed me to get closer than I ever have to such a bird… so close I felt like I could have grabbed it! Instead, I used my big 400mm (~600mm sensor equiv.) 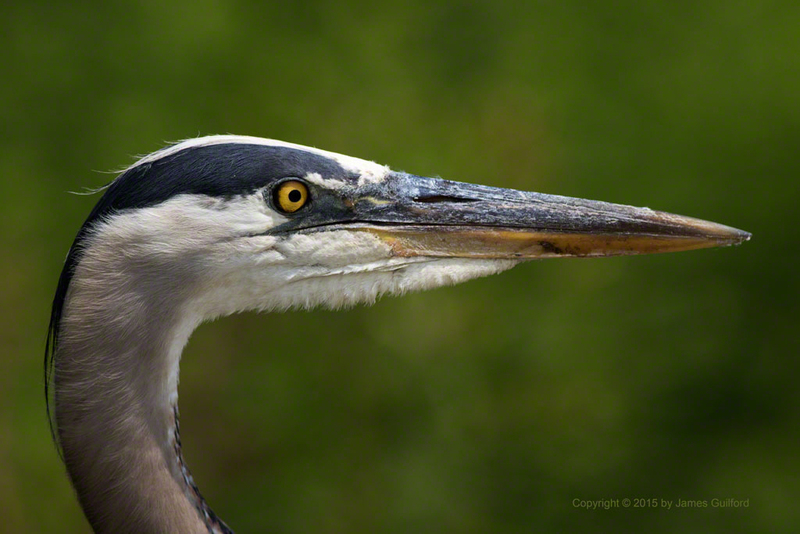 telephoto lens to capture a “heron headshot” such as I’ve never gotten. The photo shown above is uncropped! Yeah, an active day alright! This breezy day, a Great Blue Heron approached its nest. Spreading its broad wings, the bird caught the air, hovered, and floated gently to a treetop landing – graceful as a dancer in the sky!